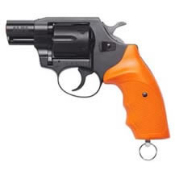 Alfa BLANK PISTOLS are rugged and reliable with bright orange grips made of high impact polymer and the orange cap on the barrel is a reminder that the revolver is not a firearm. The six shot swing out cylinder allows easy loading and unloading. A lanyard ring is included for security. Comes complete with a carrying case and cylinder cleaning brush. AVAILABLE IN 22 CAL OR 209 PRIMER. Alfa Starter Pistols are now the standard for starter pistols used in the dog training, track and field competition and law enforcement! The superior manufacturing quality of the Alfa Training Pistol is at the same level as those of the licensed arms. The Z-MAC zinc-aluminum frame with a rust resistant blued finish and the high strength heat-treated steel parts promise trouble free usage. Thanks to the automated drop safety lock and machine tooled steel double-action-trigger mechanism the revolvers are absolutely safe. Nail gun loads may jam in this pistol. Restricted shipping. ONLY Available to U.S. addresses accessible via UPS - cannot be shipped internationally.